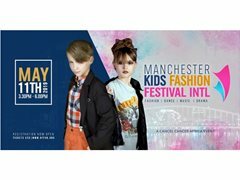 The Manchester Kids Fashion Festival Int event, will be holding May 11th, 2019. A great opportunity to allow your kids to live their dreams in front of local and national Media, Clothing Brands and Modelling Agencies. This one-day event will feature a explosive shows featuring international designers. Fashion – Dance – Singing. Kids only expected to feature in one show. We accept all Sizes, Ages 4-18, Race or gender. We believe every child is beautiful. We are very happy to welcome physically impaired kids, please come live your dream. If you can provide a donation that would be appreciated however this is not compulsory. We provide Hair styling, Makeup and the outfits. Re: Raising funds- As a charity we encourage models to help us raise funds. But this is not a criteria for selection and it is not mandatory, it is a kind choice. We accept all Sizes, Race and Gender. Beginners and Experienced Models accepted. Due to travel expense we expect models to be at the venue two hours before the event for rehearsals.